As the third stop in our five city series, Work Design Magazine, SwingSpace, and WeWork recently took the conversation to Chicago! On Tuesday, September 19th we reconvened our continuing discussion at WeWork Kinzie, in Chicago’s bustling River North neighborhood. Our attendees came from A&D, local businesses, corporate real estate and contract furniture industry. All shared the interest in hearing our dynamic panel pick up on some of the subjects discussed at our previous events in Washington, D.C. and Burbank, CA. Once again, moderated by Zak Kidd, Co-founder & COO of SwingSpace, our panel included: Chris-Tia Donaldson, Chief Executive Officer at Thank God It’s Natural; Megan Dodds, Community Director, Midwest at WeWork; Tom Marquardt, Vice President, Director of Interiors at HOK, Chicago; and Matt Ward, Senior Managing Director at Newmark Grubb Knight Frank. The panel (L/R) Zak Kidd, Chris-Tia Donaldson, Tom Marquardt, Megan Dobbs and Matt Ward. Photo by Sam Weiss. If you have been following our series of talks, we are focusing on the following questions, although the conversation at each talk has varied on how the panel took their path to determining what to discuss. What is important for businesses and leadership today? Workplace is starting to accommodate the user, not the organization. Think about it. The old break-room was insignificant space, housing a plain jane refrigerator, microwave, and coffee machine has now morphed into a centrally located, high-touch design amenity. It is now planned with people in mind, not just a place to keep your lunch and replenish your mug with probably stale brew. Today, there is cold brew coffee on tap and a basket of fruit. The change that is occurring is putting consideration of the people in the workforce in front of the real estate and design decisions. Priceless! The penny-lined kitchen at WeWork Kinzie. Photo by Keri Wiginton/Blue Sky courtesy Chicago Tribune. There is an acceleration of measuring and providing for meaning and purpose that will drive how we work. Corporate Real Estate is evolving as well. Cost per square foot is still a consideration. However, companies now consider that space is not just overhead, but it is also regarded as a productivity tool. Space layouts driven by cost efficiency are also evaluated by the value of the workplace to drive organizational change, collaboration, and innovation. Photo by Keri Wiginton/Blue Sky. Courtesy Chicago Tribune. Workspace is also a place for building a community. In corporate and communal co-working facilities, there is a burgeoning agenda promoting the use of the space to foster a greater sense of belonging among those who share the space. Whether unified under one company logo, or a collection of independent workers there are now efforts to organize and deliver events to bring people together to share ideas, make additional business connections to enhance the overall work experience for participants. The new thinking is that we can use the work environment to promote change. As companies consider retrofitting, updating or relocating, more thought, effort, design, and the cost is spent on incorporating structural organizational changes. 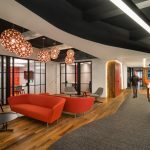 Businesses or workspace providers are supplying space more appealing to a new generation(s) of workers, and leverage advances in technology that support the different ways we are using space today and will need to use it tomorrow. Often the reason for this “change of space” is to recruit and retain talent in a competitive market. You can recruit until you are blue in the face but are they staying? In conclusion, the consensus is that there is still enormous value in providing workspaces that are designed in ways that allow for all the types of personal and virtual interaction that make up the work experience. Just for fun, Zak asked the panel to describe what is the most important thing about their workspace. Photo by Lauren Kallen. Courtesy Office Lovin’. Tom – Sitting amongst others in a large open space – I like having small, accessible breakout rooms and ad hoc spaces and the ability to be flexible throughout the day. Megan – Must be dog-friendly! Chris-Tia – I have a small desk in the corner. It usually has so much stuff strewn about. The staff “stages” it when we have a photo shoot or other activity requiring it to look more pulled together. Considering that I started in the condo kitchen – I can work in any environment. Matt – Surrounding myself by philosophy and meditation books that remind me that the core of my peace and happiness lies outside of my work. WeWork Kinzie – Top Dog! This golden doodle was very satisfied with what he heard. Photo by Sam Weiss. Curious about what our Washington DC panel had to say about the same topic? Click here. Please plan to join us for our final two city discussions and see who is lined up to lend their thoughts in Atlanta and Toronto! CBRE Furniture Forum – What’s Next?